It’s all about control, user experience — and good old fashioned frustration. Since October last year I’ve been experimenting with Facebook’s Instant Articles format and Google’s Accelerated Mobile Pages (AMP) on my website/blog, Medieblogger.dk. Both formats aim to give users a faster load on the mobile phone, but they do it in different ways. Instant Articles only work in Facebook’s app, while AMP is a web format, that can exist next to (or instead of) your normal website. My biggest issues are with AMP, but let’s start off with Instant Articles. Recently I finished reading Walter Isaacson’s Steve Jobs biography. One of the things, Jobs cared about (a lot) was having complete control over the user experience. This is why you don’t find Mac and iOS operation systems on other units, just as you won’t find other operating system on Apple units. Now, I know I’m no Steve Jobs, but I get the point about having control over the user experience. You don’t really have that with Instant Articles. Sure, you can have separate rules, but it almost looked like a Facebook form of settings and rules that had to be set up — and even if you did all that, I’d still question how effective it was. I still think that all Instant Articles look alike. When I choose a new design (or ‘theme’ as it’s called when you are using WordPress to publish) which I did recently I put immense weight on the reading experience, both on desktop computers and mobile phones. It might be the column width, the text size, font or something else that needs some tweaks. If I want some consistency across web and the Facebook app I would have to get these tweaks and changes into Instant Articles. By not having Instant Articles I don’t need to do these things. Okay, the articles load slower and that makes for a potentially poorer user experience, but it gives the users the experience I can vouch for, so to speak. If Facebook all of a sudden decide that links should have a different color or that blockquotes should be shown in another font or have a background color, I am subject to that — whether I like it or not. Instead, I choose to live with longer load times — and maybe a WordPress website without a ton of plugins isn’t the biggest performance hog in the world. Another thing I don’t like about Instant Articles (and which I have written about before) is that it introduces another stream of comments to moderate [Medieblogger (in Danish)]. This means that if two people reading the same article each write a comment om the same article on my website and the Instant Articles version, they won’t see each other’s comments. To me, that was a strong argument in favor of having only one version of the content. Also, there are two “layers” in Instant Articles. There is the content itself (the Instant Article) and the post(s) where the article is shared. These are two different types of objects, so if someone likes or reacts to (or comments on) one object (for instance the post on my website’s Facebook page sharing the Instant Article) it won’t show up on the other object. Here I chose to cut out the Instant Articles layer. My frustrations with AMP are somewhat similar to what I’ve mentioned above — and then there’s some added frustration on top of that. Plenty. My problems with AMP can really be summed up in one sentence: AMP is trash. First, let’s take a look at what AMP really is. It uses its own tags, which means that you write <amp-img> instead of <img> which is downright silly. You have to call a script (from Googles ‘content delivery network’) in order to get AMP to work. The script prioritizes the load of the web page, for example it makes sure that elements like images aren’t loaded until right before they are to be shown. This create a dependency in an otherwise ‘open’ format. The AMP team probably have their reasons for this, but for those of us implementing AMP it could at least have made more sense if you could include the script in your existing HTML, which then would get its load optimized. This is a part of AMP that has been criticized quite a lot recently. Much of the traffic on AMP-optimized pages are referred from Google search results. Google has even begun highlighting AMP pages in the search results (like Facebook marks Instant Articles with a small lightning in the app), and it loads amazingly fast — because Google loads the content from the Google domain, where the search results are. What this means is that the user is looking at the content on google.com (or some other Google domain) and not the website where the content is actually coming from. It also affects the user experience. First, the page scroll gets worse and you can’t search on the page in Safari on iPhone. Originally you have to manually remove the Google domain from the URL in the browser’s address bar to get to the original page, but Google has since (probably due to public demands) included a link-button which can get you there much easier. But it’s still less than ideal. Gruber links to this The Register article, which has a fair amount of criticism of AMP — and has links to other articles like it. I agree, this is not good enough — to put it kindly. But Twitter is different. It links to the AMP version of an article (the URL address followed by ‘/amp/’) which, in a way I haven’t quite figured out yet, is pulled from Google’s servers. Here the load improvement is less significant than from Google’s search results — which means there is less reason to use AMP. Maybe there are better plugins out there, but I chose to use the one I trusted the most. However, it offers almost no customization (I can, as far as I can recall only switch between a light and a dark theme) and not only isn’t the design pretty — it’s only partially translated. For instance, if you were reading an article published two hours earlier, it would say “To timer ago” (“to timer” is Danish for “two hours”). That is somewhat not cool. Here we are also touching on some of the things that annoyed me in Instant Articles: That I have to make all kinds of tweaks (provided that I actually find a plugin that allows me to change anything) to change the design and reading experience into something of my liking. I am sure there are WordPress themes out there supporting AMP (I know there are) but the theme I’m currently using doesn’t — so that doesn’t really change anything. But it’s worth considering if you want AMP on a WordPress-powered website. I deactivated the AMP plugin in WordPress and all was well. Until I later tha day pressed a link in the Twitter app pointing to an article on my website. 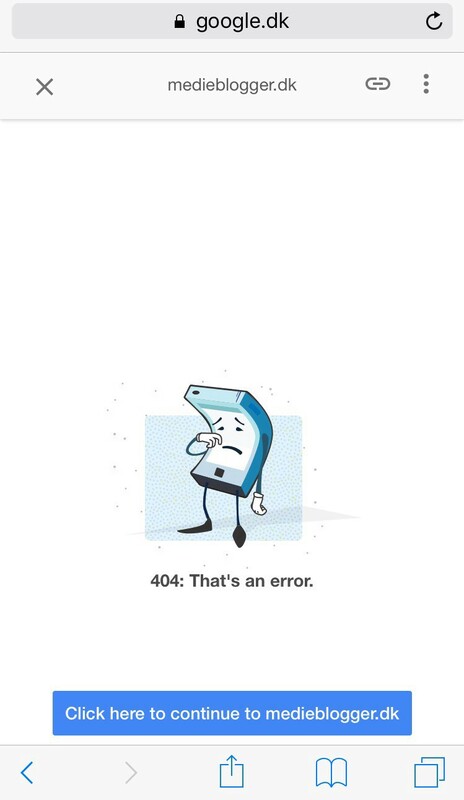 I got a 404 error page (“not found”), which made no sense to me; the website was working the way it was supposed to. Then I discovered the problem: Twitter was linking to the AMP version (where the URL adress has ‘/amp/’ appended) and this didn’t exist anymore. It was the same with search results, which still showed the cached version; it was only a matter of time before that would run out and error pages would be displayed here as well. So, by deactivating the official WordPress AMP plugin I rendered my website close to useless in the Twitter app and Google’s search result. Pretty annoying. I did, however, find a solution. I had to install a plugin allowing me to redirect the traffic to the ‘/amp/’ pages to the original URL address. This is (if you ask me) a less than ideal way to do it, but it solved my problem; Twitter links started working again. It’s actually pretty crazy when you think about it… Until Google re-index the articles in question, I have to live with the fact that it’s Google’s error page that is being shows — not my own, so I at the very least could inform the user why he/she is looking at an error page and that the content is still available. You can be the guinea pig.